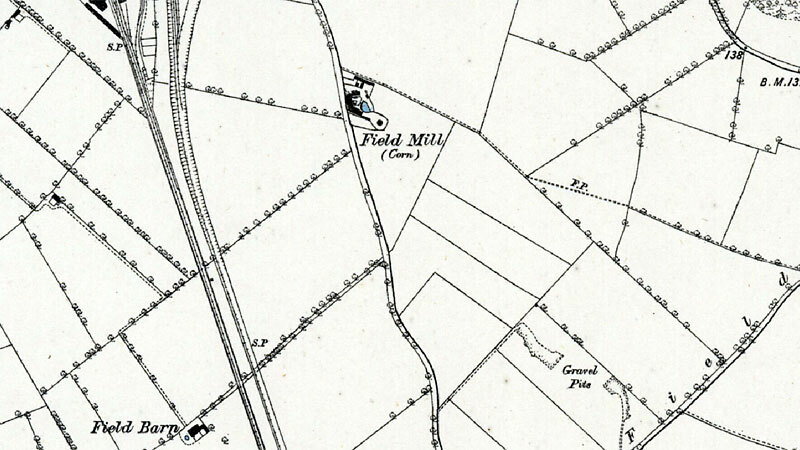 Yarmouth Road post mill in North Walsham was also known as Youngman's Mill or Field Mill and is shown under the latter name on the 1890 Ordnance Survey Map. 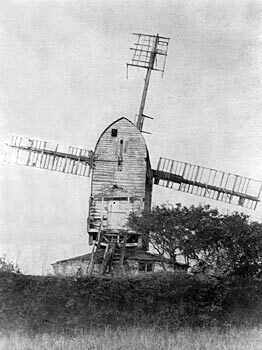 The mill buck was set on a 2 storey roundhouse and had a gable end porch and and was moved into wind with a tail pole. The 4 double shuttered sails, each with 8 bays of 3 shutters were struck by rack and pinion. 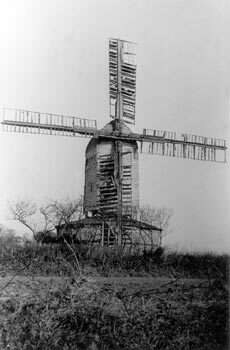 TWO WINDMILLS with their going Geers, one being near St._Giles_Gates, Norwich and the other at North Walsham in Norfolk. Also the Remainder of a Term for sixty years which commenced in 1747 of a good water_mill with a Dwelling House and small farm adjoining, being in Dilham, late occupied by Mr. Joseph Cole. For further Particulars enquire of Mr. Marker at Dilham aforesaid, Mr. Gaze of Paston, or Mr. Gay of North Walsham. All such Persons as are indebted to the said Joseph Cole are desired to discharge the same immediately to some of the abovesaid Persons or they may be sued. A Very desirable ESTATE at North Walsham, Norfolk, comprising a Dwelling house, barn and other requisite buildings, a capital WINDMILL with granaries and machinery adapted for preparing and dressing Oatmeal and Flour and 10 acres of arable land; in the occupation of Mr. John Durrant and of whom possession may be had at Michaelmas next. The Dwelling house, Mill and Buildings have been erected and fitted up at a considerable expence and the situation is very convenient for carrying on an extensive trade. Part of the purchase money may remain on security of the estate. Apply to Mr. Wm. Forster, Attorney at North Walsham aforesaid. Will dated 17 December 1807.
to be sold, proceeds to wife. 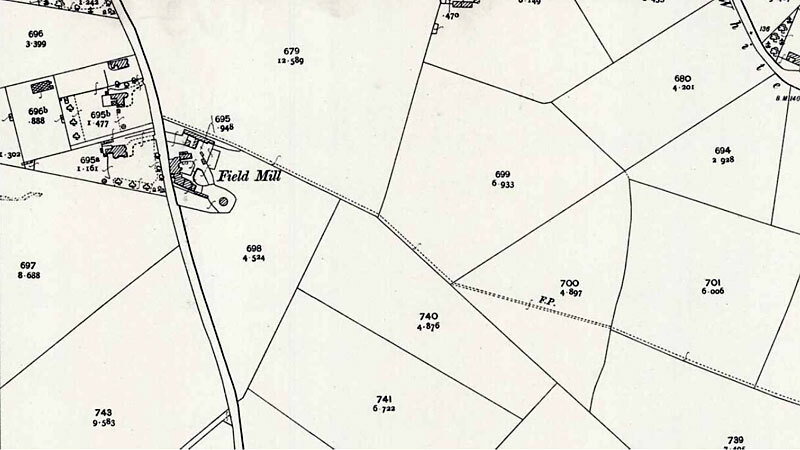 A Very good Dwelling House with convenient buildings, excellent Corn Windmill and about 22 acres of land of the first quality in a ring fence adjoining to the dwelling house in North Walsham in Norfolk, late in the occupation of Mr. William Pitchers deceased. The situation is very eligible for carrying on an extensive trade adjoining to the town of North Walsham, an excellent corn market and distant about four miles from a river navigable to Yarmouth. Apply to Mr. William Forster, Solr. North Walsham aforesaid. THUNDERSTORM - On Friday afternoon ... The lightning struck the gable end of the building belonging to Mr. Isaac Youngman, miller, knocking a considerable part of it down, but doing no further damage. Mr. John Youngman and an apprentice who were in the mill adjoining both felt the effects of the shock and Mr. Youngman was quite stunned for some time afterwards. Pudding Stuff and Dumpling Dust at the usual prices. Good Malt 8s. 6d. per bushel. Prime Hops 1s. 2d. per lb. Orders thankfully received. To Let with Possession at Michaelmas a neat and pleasantly situated COTTAGE at the Mill, Yarmouth Road. 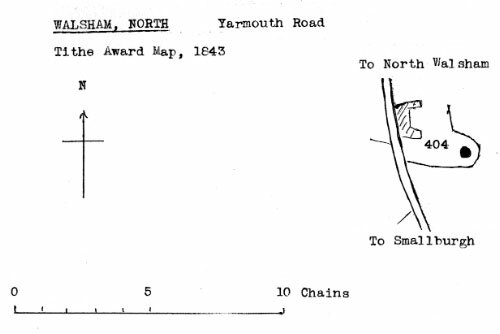 Apply to Mr. Isaac Youngman, Field Mill, Yarmouth Road, North Walsham. 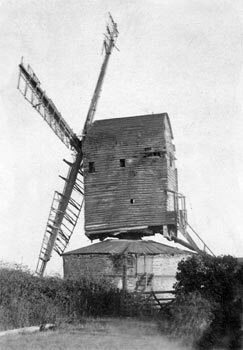 A few days since, a pony belonging to Mr. Isaac Youngman, miller, strayed into the mill yard and went so near the mill that one of the sails struck it on the forehead fracturing the skull and killing it on the spot. A NEAT and pleasantly situated COTTAGE at the Mill, Yarmouth Road. adapted for a small Family.